Are Tax-Free Municipal Bonds Right for You? Investors are typically attracted to municipal bonds for three reasons, potential safety of principal, potential regular predictable income and the potential for tax-free benefits. Together, these three elements can make a compelling case for including tax-free municipal bonds in your portfolio. Many investors, particularly those nearing retirement or in retirement, are concerned about protecting their principal. In March of 2012, Moody's published research that showed that rated investment grade municipal bonds had an average cumulative default rate of just 0.08% between 1970 and 2011. * That means while there is some risk of principal loss, investing in rated investment-grade municipal bonds can be a cornerstone for safety of your principal. 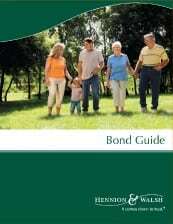 Municipal bonds typically pay interest every six months unless they get called or default. That means that you can count on a regular, predictable income stream. Because most bonds have call options, which means you get your principal back before the maturity date, subsequent municipal bonds you purchase can earn more or less interest than the called bond. According to Moody's 2012 research,* default rates are historically low for the rated investment-grade bonds favored by Hennion & Walsh. Income from municipal bonds is not subject to federal income tax and, depending on where you live, may also be exempt from state and local taxes. Triple tax-free can be a big attraction for many investors in this time of looming tax increases.